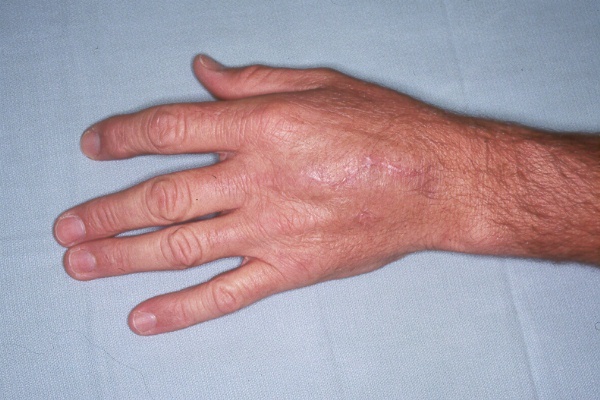 Metacarpal fractures are common injuries. 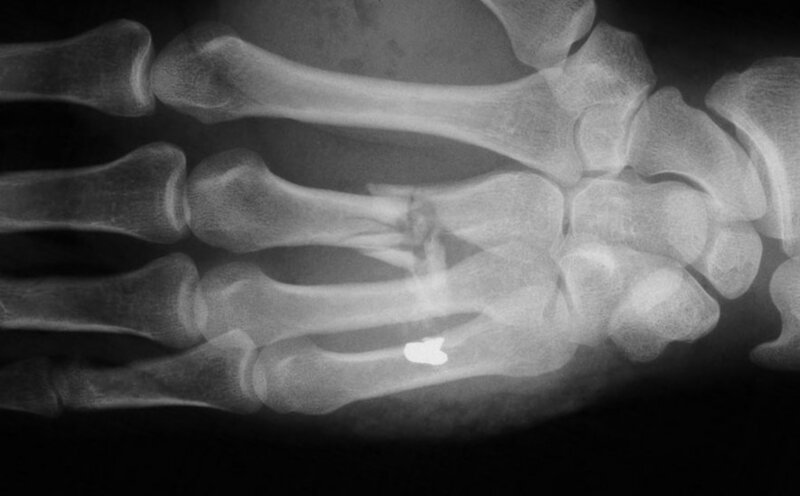 Metacarpal fracture nonunions are uncommon because of the support provided by adjacent metacarpals, but can be a difficult problem following high energy trauma. 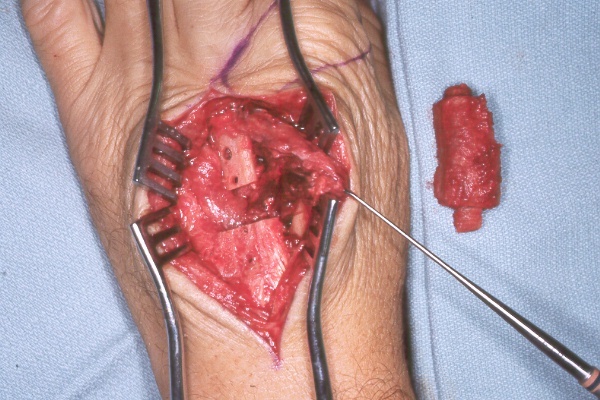 This series of pictures document the difficulty of treating a middle metacarpal nonunion following a gunshot injury. 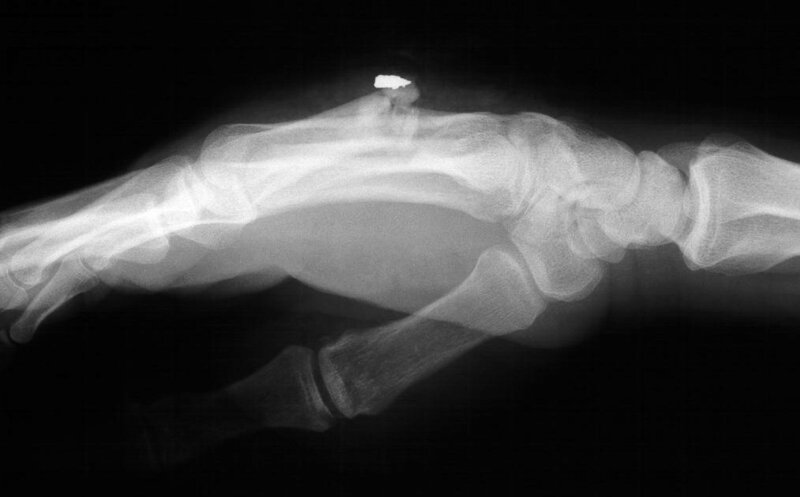 The injury: point blank handgun injury, palmar to dorsal through the middle metacarpal. Contusion of the third web space common digital nerve. 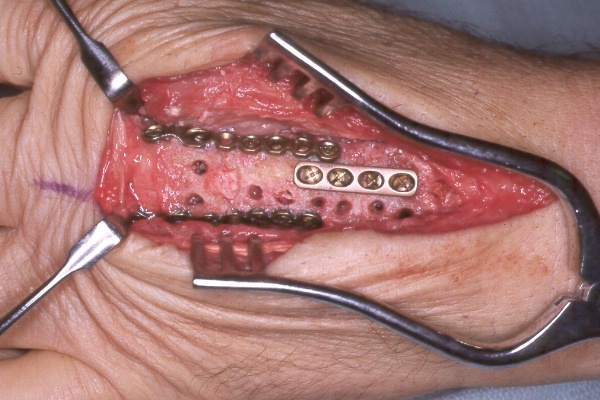 The treating surgeon debrided the wound and maintained length with intermetacarpal pins. 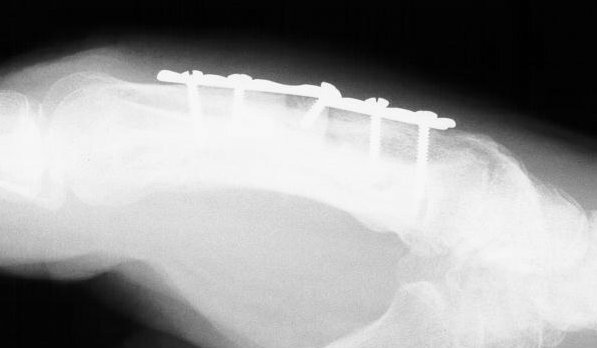 When the wound was stable, the fracture was treated with bone graft, plate and screws. At this point, I took over his care. 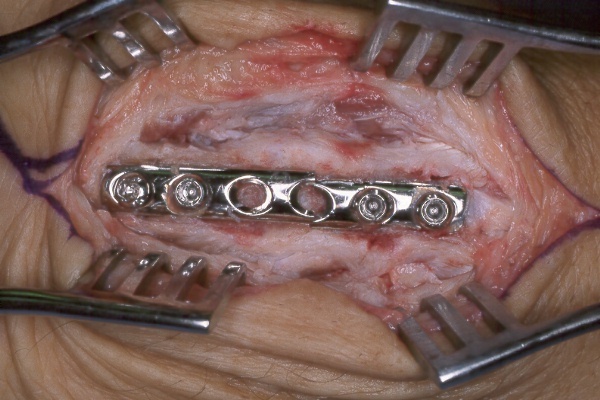 debrided the sclerotic fracture site, took down the cross union, interposed a second web space interosseous muscle flap to prevent recurrent synostosis, and used an iliac crest segmental graft carved with intramedullary dowel extensions. I used the Synthes modular hand set, which has screw intervals different than the small fragment set. This was the longest plate available, not optimum, but had six cortex purchase on each side of the graft. but began to pull out at six weeks. 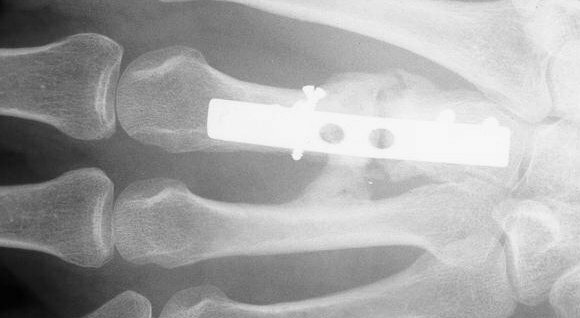 I removed this hardware, and used two mini condylar blade plates at right angles to resecure the distal bone juncture. 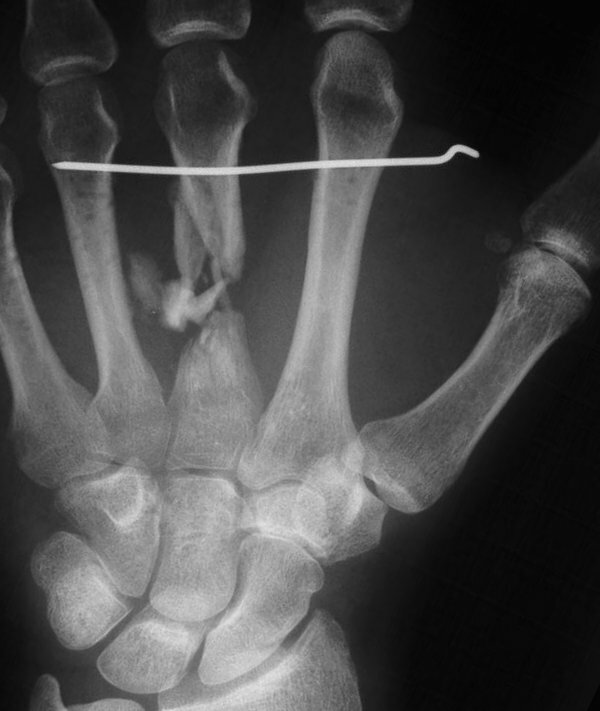 This allowed more distal purchase while avoiding hardware placement beneath the metacarpal head extensor hood. 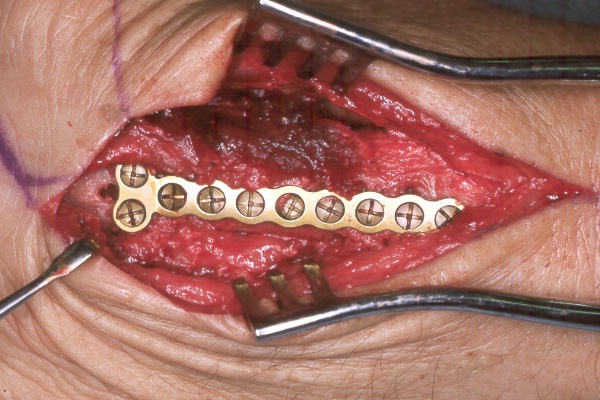 I replated the proximal bone juncture although it looked clinically healed - not worth taking a chance. 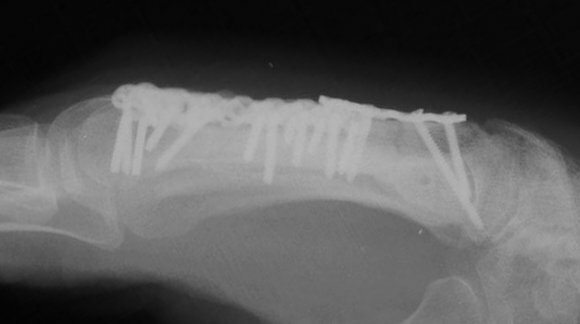 And clinically, not normal, but doing well considering what he has been through. 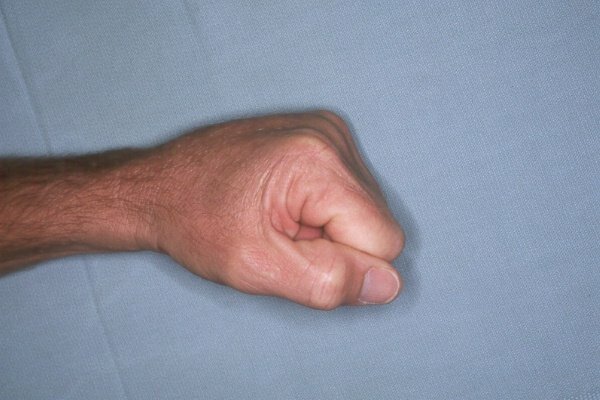 A similar gunshot metacarpal injury can be seen here.